Mules are such a HOOTT shoe style right now, I mean I can’t seem to get enough of them. I’ve been wearing my flat, slip on mules and my blush block heeled mules everywhere. Since realizing how much I love this style and how they can be worn in so many ways, I just HAD to have a basic black mule. I feel like a heeled mule is the new basic pump. I recently received this pair from Restricted Shoes and have been wearing them with everything. I have tried several options on and THIS pair so far has been my favorite. They are so comfortable and easy to wear with everyday style and so affordable. I think one of the best things about them for me is the heel height. It’s enough to know I’m wearing a heel, but not so tall that I can’t chase my kids around…I know all of you moms out there know what I’m talking about!! I recently went to an event and wore them with a dress, and then another day paired them with skinny jeans. Yes, both times I wore them with this floral kimono, but it’s just because I’m getting on board with this trend. Kimonos are making such a statement these days. I think I love them because it’s totally like wearing your robe in public, but it’s acceptable. They’re comfy, cute and add such a great statement to a dress or over jeans. It’s one of those items you can throw over any outfit and look put together and polished. DISCOUNT BONUS ALERT: you can use code KFLEX25 to get 25% off your purchase of regular priced items from Restricted Shoes now through August 31….Makes these already affordable shoes feel like you are getting them free! Besides these mules, there are so many great shoes to get you ready for Fall, so stock up on all of my favorites. These Navy booties are perfect to pair with jeans. I know you’ve seen me wearing my slip on mules with just about anything and THIS pair is perfect. This lace-up wedge is so on trend to wear now with jeans, shorts or cute shift dress. I mean seriously, so many great styles! So what do you think, are you a big fan of the mule and kimono trend? Thanks so much for stopping by, how you’re having the best week! 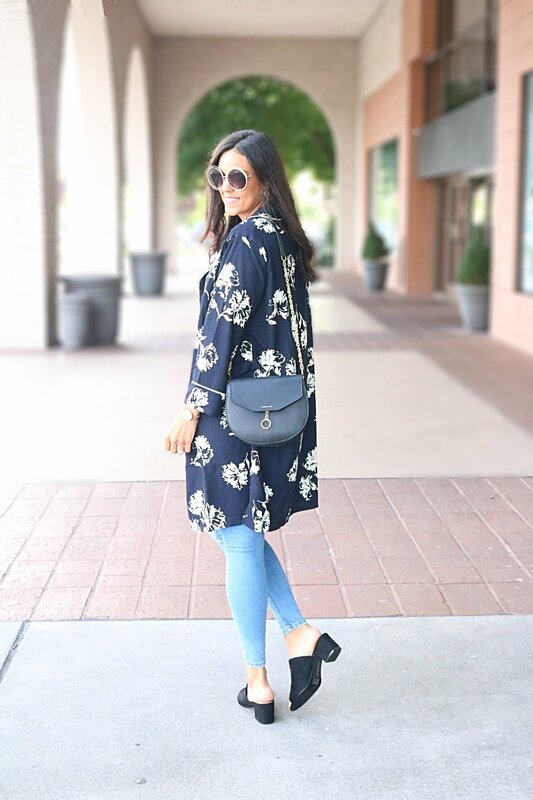 You styled the kimono perfectly for day & evening. I’ve been on the lookout for one all summer but haven’t had any luck locally. This kimono is so chic! It looks so cute paired with the mules! You look amazing, babe! I loooove your floral kimono. But those mules, need those in my life! YES I couldn’t agree more! Love mules for the same reasons you mentioned and I do think they have indeed replaced pumps. They are simply so easy to wear and style! Oh my goodness!!! I absolutely love how you styled this kimono style jacket and really love the mules so gorgeous!!!!! Mules totally are theee sh*t right now! I love them on women and one thing that works for both men and women and is a trend I love is kimonos. They’re so elegant and have such beautiful prints and most of all, they’re light weight as well! Simply stunning! I have 2 pair of mules, but neither of them look this comfy. These are a lot lower and therefore, a lot easier to walk in I’m sure. Great shoe choice to pair with that kimono! You look so cute girl! Love this look! I’m not a big fan of mules myself because I don’t like not having like a strap or something on the back of my shoe hahaha call me crazy! I totally love how the mules have taken over the shoe scene whether luxury or high street!! !and the kimono are the best thing to happen to comfortable clothing ,I would wear them everyday !! !love how you styled the two looks!!! I totally love that the mule trend has taken over the shoe scene whether luxury or high street!! !love a kimono any day I’ll wear them everyday if allowed!! Girl, THANK YOU for this post. I have some kimonos sitting in my closet and I have never worn them because I just struggle with how to style them. Your outfits are so simple, yet so perfect!